Have you ever been photographed while you were photographing? No? Well, I was. Just when I was about to take a picture of the gastronomic scenery along the Plaza Serrano (officially Plazoleta Cortázar) in Palermo Viejo, the girl in the blue jacket photographed me just like that. 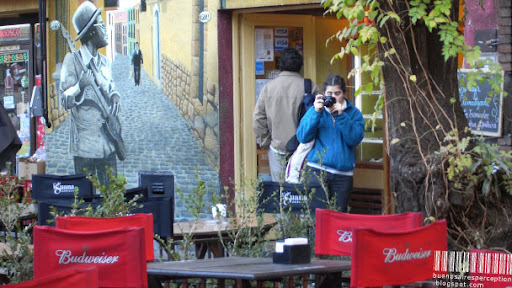 I never thought it would happen to me because usually it's me that strives through the streets of Buenos Aires snapping everything that's of interest. (; It caught me off guard, but it was fun. Funny! Makes one wonder as to how many times this has happened without you being aware of it! Maybe you'll end up in some magazine and become famous! It happened to me just last weekend. I was photographing something in the Old Town in Bucharest and kept thinking about the framing when I happened to turn my head and noticed that someone was taking a picture of me. It felt a bit weird. Funny is, the guy turned to his friend and said in Romanian "Darn, she noticed me". I think they thought I was a tourist and didn't speak Romanian. this is a funny situation! never happened to me!! So, did you have a chat with her? Haha! I like the humour in that. I wonder if she has a blog. don't you? Now you know the feeling! :-) The trompe-l'oeil works prefectly on the composition. Ah, those darned guitar players! Typical, isn't it. Everyone is photographing everyone else and everything. Love that mural on the left - it all flows. So you got your own back! Do you think she was just as piqued? Dear friends and followers! My apologies for my long abscence. The blog is currently suspended due to a high work load. I'll be back, promise! Buenos Aires Perception is on holiday. Till January, I will only post when I feel inspired and have a stable internet connection. (; Thanks for the visit, hope you will stop by again soon and check out the new photos. Stay tuned! Buenos Aires Perception turns 6 months old. This seems a good occasion to say thank you to all visitors for stopping by and leaving comments. You enjoyed the blog? Please consider to vote for Buenos Aires Perception. Empty Billboard - No Logo Buenos Aires?